We mean yeah, desserts are good but alcoholic desserts are so much better. Two birds...One stone. That's all we're saying. Just looking at the recipes will make you a little tipsy. Caramel bourbon ice cream, everything is right with the world. Possibly the most scrumptious looking cupcakes EVER! Fluffy layers of chocolate cake drenched in kirsch syrup, mascarpone frosting, more kirsch, shaved chocolate, chocolate ganache and fresh cherries. YUM! Apples soaked in bourbon, topped with cinnamon ice cream. Oh. My. Lord. Rum truffles with some added glitter...Just because. A dessert you can drink. The best of both worlds. Guinness, chocolate and Irish cream, this is our kind of dessert. A sweet and lightly citrusy warm pear combined with crunchy, cinnamon-spiced toasted oats and fluffy whipped cream. It's like a party in my mouth. Baileys and chocolate is EVERYTHING! Got a bottle of wine lying around? Then get making these. Rolled up balls of brownies, flavored with dark rum. I dare you not to finish a whole patch in one sitting. A bite into this cake, reveals a filling of amaretto. Naughty yet SO nice! A dessert and a mini cocktail all in one. Also known as utter perfection. Baileys in anything is our kind of dessert! The chocolate melts in your mouth, leaving the creamy taste of baileys behind. Deep fried cake, soaked in tequila. So bad, but SO GOOD! 19. 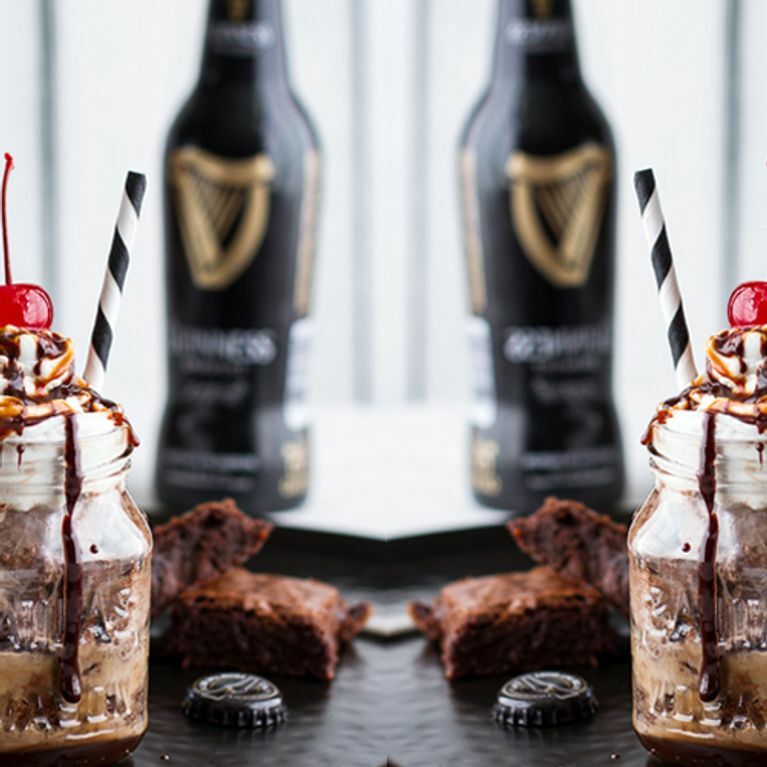 Mini Chocolate Guiness Brownie Sundae Floats with Burnt Irish Caramel + Hot Fudge. The best fudgey brownies made with a little Guinness and a layer of burnt Irish caramel. YUM! This is so dangerously good.